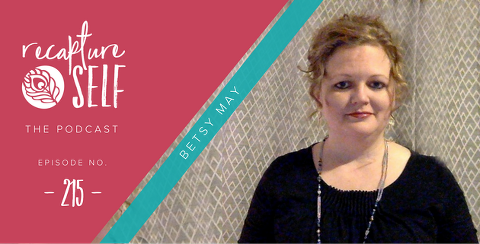 Today I’m chatting with Betsy May – she’s a full time working mom of one energetic daughter and creator of ‘Your Nurturing Nook’ a blog that helps moms seek more calm and self-care in their days. Betsy is a nature lover who enjoys walking barefoot in the grass, candle light, peonies, curling up with a good book, fairies, the sound of rain, and the mysteries of the moon. Her creativity comes from a passion for the healing arts. She became a Certified Holistic Health Practitioner in 2005 and received her registered yoga teacher certification in 2008. Simply chatting with Betsy is like a relaxing walk through the woods. So settle in with a cup of coffee or tea and get ready for a restful 30 minutes. How to be of service to yourself and to others when you’re hurting inside. Why rituals and routine are so important to supporting creativity and not stifling it. The idea of redefining meditation and how to make it work for you. Plus Betsy tells us about her new project that will give moms a simple way to slow down, create more calm, and build self-care into their days. HOMEWORK: SNAP A PHOTO THAT SHOWS HOW YOU’RE MEDITATING THIS WEEK. COME FOLLOW @BERYLAYNYOUNG ON INSTAGRAM. USE THE #RECAPTURESELF WHEN YOU POST. I’LL SHARE OUT SOME OF YOUR POSTS THIS WEEK! Also, If you liked this episode it would mean the world to me if you’d head on over to iTunes and leave some love in the form of a review. While you’re there please do subscribe and share this podcast with your friends too. I’d love to make sure you get new episodes delivered straight to you as soon their ready.